It's a fact that the fur companies considered their business to be extractive south of the Missouri River because there it was a zero-sum game: Whatever they managed to win they had to take away from their competition. Similarly today some people think cropping under irrigation is extractive because it depletes sources of water that ought to be kept available for other purposes. However, there is no doubt that mining was and is extractive since what's dug up and used up is gone forever. This is the usual sense of the word. In its early days South Pass City was nothing much, but it was at least a little bit of a settlement on the California Trail. Mark Twain happened by in 1861 and wrote about it a decade later. His memoirs and those of Sir Richard Burton describe the mountains in Alpine terms. These viewpoints are not so evident today from the way modern highways have been situated since World War II. "Toward dawn we got under way again, and presently as we sat with raised curtains enjoying our early-morning smoke and contemplating the first splendor of the rising sun as it swept down the long array of mountain peaks, flushing and gilding crag after crag and summit after summit, as if the invisible Creator reviewed his gray veterans and they saluted with a smile, we hove in sight of South Pass City. The hotel-keeper, the postmaster, the blacksmith, the mayor, the constable, the city marshal and the principal citizen and property holder, all came out and greeted us cheerily, and we gave him good day. He gave us a little Indian news, and a little Rocky Mountain news, and we gave him some Plains information in return. He then retired to his lonely grandeur and we climbed on up among the bristling peaks and the ragged clouds. South Pass City consisted of four log cabins, one of which was unfinished, and the gentleman with all those offices and titles was the chiefest of the ten citizens of the place. Think of hotel-keeper, postmaster, blacksmith, mayor, constable, city marshal and principal citizen all condensed into one person and crammed into one skin. Bemis said he was 'a perfect Allen's revolver of dignities.' And he said that if he were to die as postmaster, or as blacksmith, or as postmaster and blacksmith both, the people might stand it; but if he were to die all over, it would be a frightful loss to the community." The reference to "Allen's revolver" in Twain's description requires amplification. Earlier in his account he had provided the following definition. The Allen figures in one or two other droll anecdotes as well. "Mr. George Bemis was dismally formidable. George Bemis was our fellow-traveler. "He wore in his belt an old original 'Allen' revolver, such as irreverent people called a 'pepper-box.' Simply drawing the trigger back, cocked and fired the pistol. As the trigger came back, the hammer would begin to rise and the barrel to turn over, and presently down would drop the hammer, and away would speed the ball. To aim along the turning barrel and hit the thing aimed at was a feat which was probably never done with an 'Allen' in the world. But George's was a reliable weapon, nevertheless, because, as one of the stage-drivers afterward said, 'If she didn't get what she went after, she would fetch something else.' And so she did. She went after a deuce of spades nailed against a tree, once, and fetched a mule standing about thirty yards to the left of it. Bemis did not want the mule; but the owner came out with a double-barreled shotgun and persuaded him to buy it, anyhow. It was a cheerful weapon — the 'Allen.' Sometimes all its six barrels would go off at once, and then there was no safe place in all the region round about, but behind it." South Pass City sits in the high, dry, cold sage desert just east of the crest of the Continental Divide. The otherwise generally level terrain is crisscrossed with shallow ravines and gulches, many of which contain small streams. South Pass City is concealed by the banks of Willow Creek. Salt Lake papers of July 1, received here, give accounts of rich gold discoveries in the mines of that territory. Three men brought in 40 ounces of quartz dust, which assayed over $700. These mines are located in Green river country, 200 miles distant from Salt Lake. 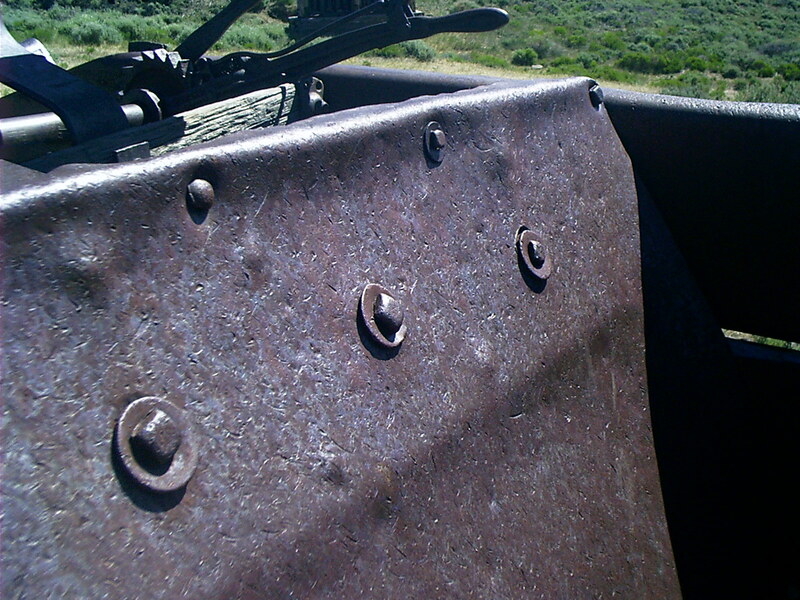 "The lode, along Willow Creek, had been discovered in 1865 by Tom Ryan of the Nevada Volunteers. By the time Ryan could report his discovery, a company under H. S. Reedall had registered the claim." "James Chisholm, in his Journal, reported an 1868 population of 50 or 60. In some instances the sale of lodes was very profitable. … The rush, however, had ended by 1873, and the Carissa was idled. 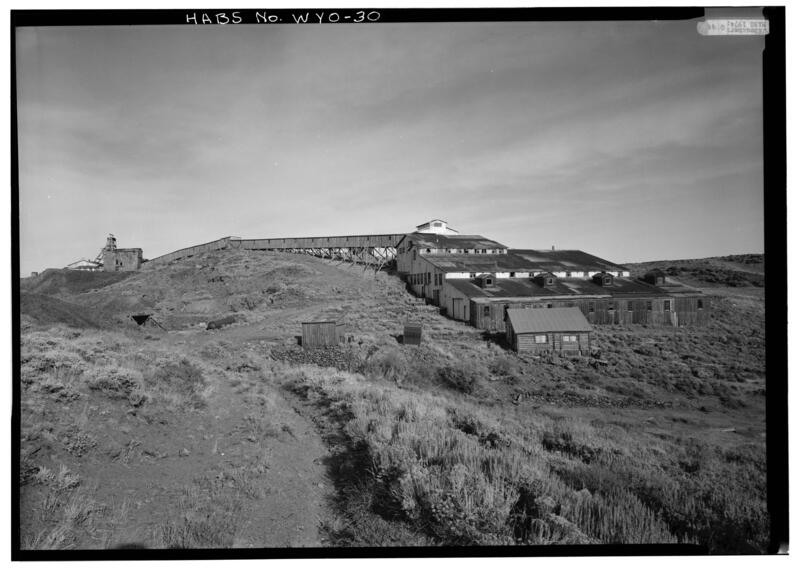 Governor J. W. Hoyt reported in 1878 that 'South Pass is a scene of vacant dwellings, saloons, shops, and abandoned gulches.'" • Dobson, G. B. 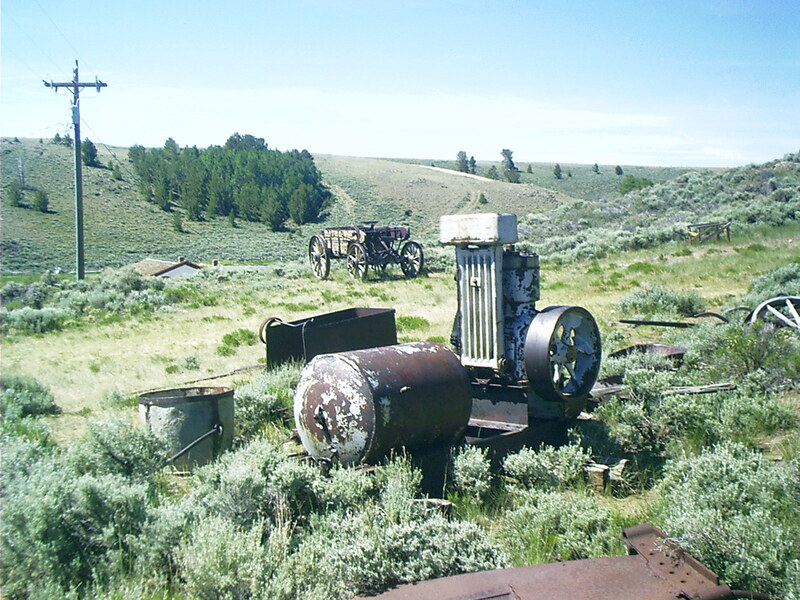 "Ghost Towns of Wyoming." 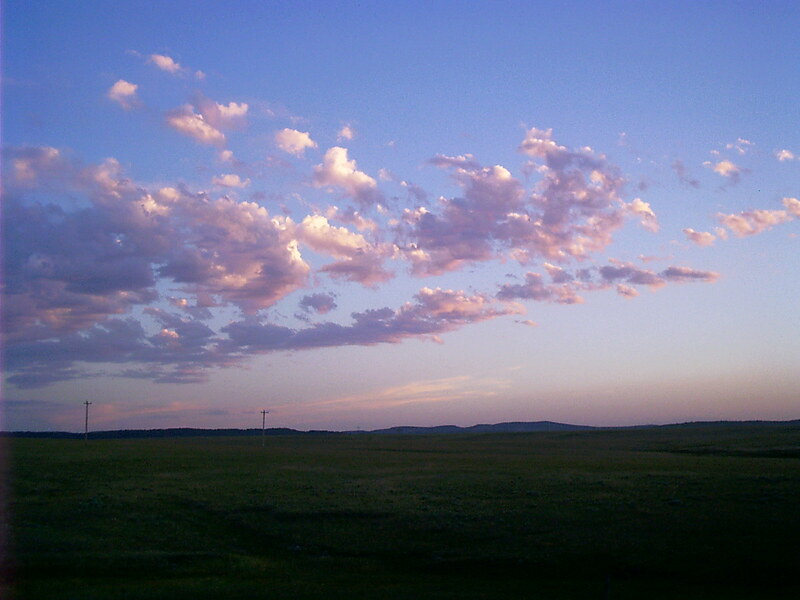 Wyoming Tales and Trails. 29 July 2007. 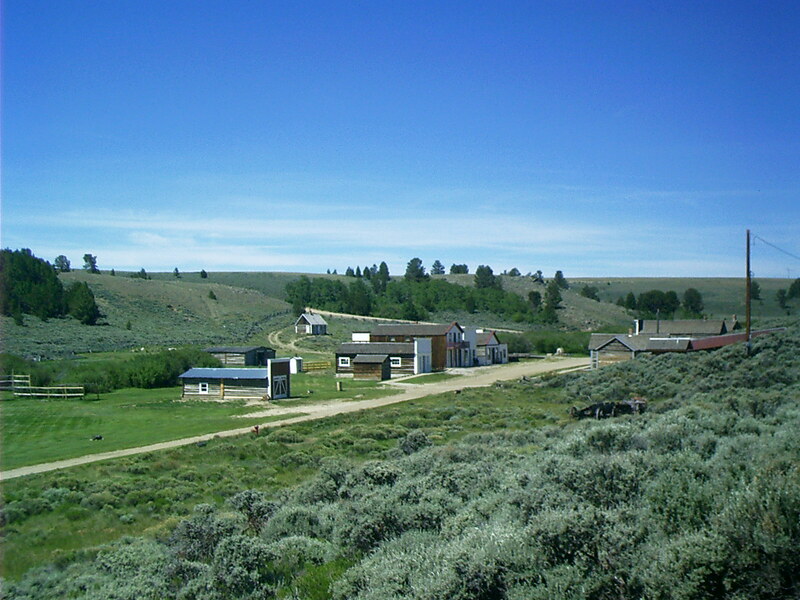 28 Aug. 2007 <http://www.wyomingtalesandtrails.com/photos9.html>. 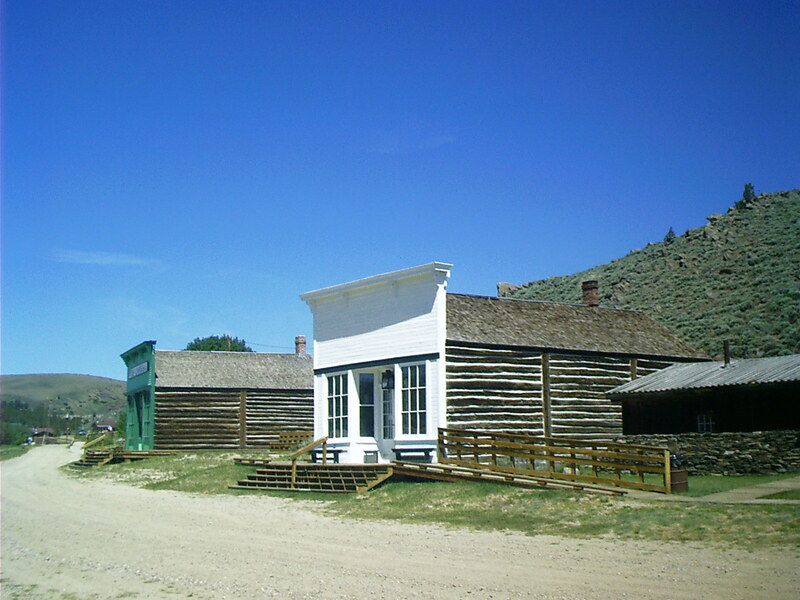 Today the east side of town is owned by the state of Wyoming and operated as a museum campus. A few people still live on the west side. 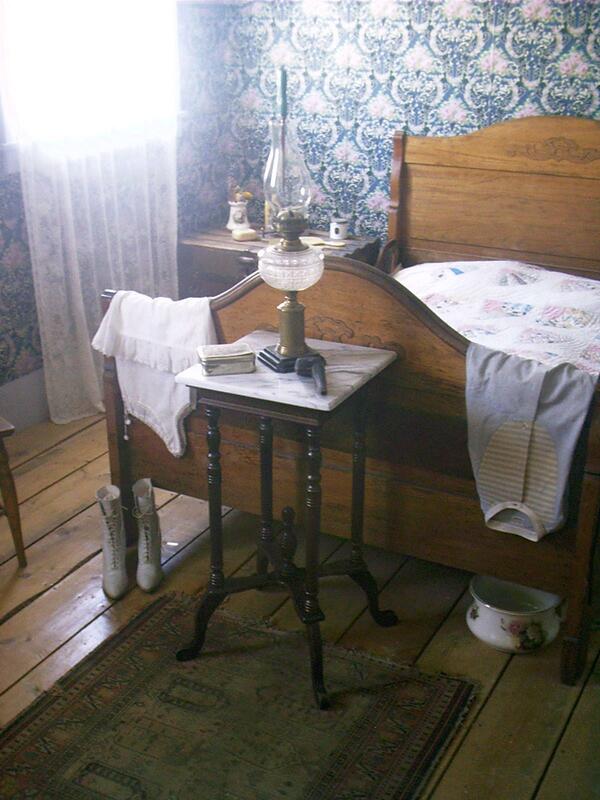 The historic site is billed as a ghost town but in fact was never wholly abandoned. Population figures have always been notoriously inflated, though. There are supposed nowadays to be about as many people in the area as there have ever been — from several hundred during the peak boom to around a hundred now. I must interject just one personal observation about desert road building in Wyoming. Engineers seem to revel in their freedom to lay out the most direct routes without regard to providing for rain runoff by introducing ditches along the right of way shoulders. Consequently streets will often start straight up a hill without displaying any interest in availing themselves of easier grades. The surface is gravel, not crushed stone, and in dry weather is prone to rolling up into washboard from edge to edge and top to bottom. I can only imagine what it must be like during a spring thaw. Those who ride heavy touring motorcycles with skinny front tires and yet harbor the least trepidation about falling down on dirt should seek their amusements closer to macadam highways. The 19th century splendor of buildings inside the historic site has been restored. $4 admission is charged. Be considerate of yourself at these altitudes. Don't exercise heavily or for extended durations, and drink plenty of caffeine. 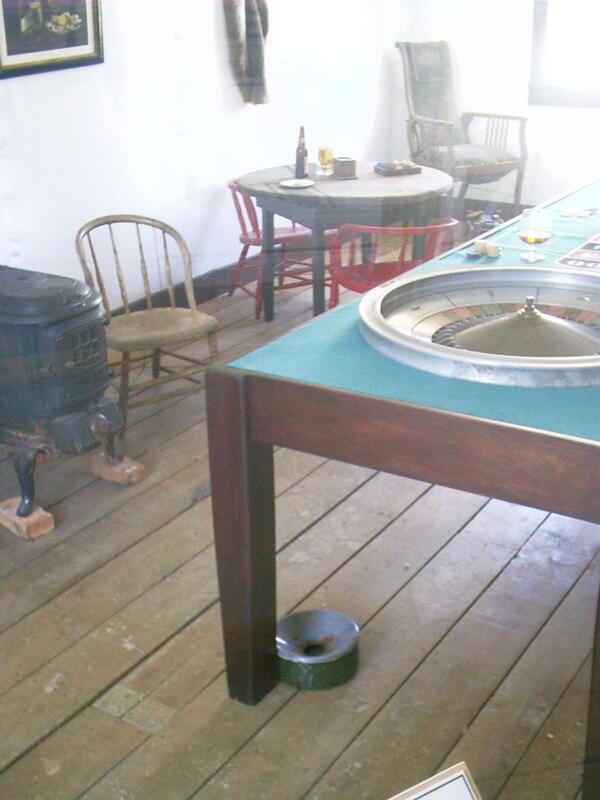 Plexiglas sheets block the doorways through which exhibits may be dimly viewed, like those at Buffalo Bill State Historical Park, Fort Laramie National Historic Site, and Fort Bridger State Historic Site. Such obstructions keep out the dust but negatively impact the photographer's appreciation of the restorer's art. • Boucher, Jack E. "The Carissa Mine, South Pass City Vicinity, South Pass City, Fremont County, WY." Photograph. American Memory. John Poppeliers, gen. super. Washington, DC: Historic American Buildings Survey, 1973. Library of Congress. 27 Aug. 2007 <http://hdl.loc.gov/loc.pnp/hhh.wy0072>. The Carissa Mine at South Pass City was developed around 1868 and worked until 1873. It was reopened and expanded in 1901 and worked until 1906. Again it was reopened and worked briefly after World War II. Some sources claim the present buildings were moved to the spot from a nearby mine in the 1920s. The state of Wyoming is fencing in, boarding up, and blocking off the mine shafts in the vicinity. They have removed hazardous material from the site, replaced roofs, and reglazed windows to stabilize the structures that exist. Safety railings will be installed within a couple of years to make the buildings tourist- if not handicapped-accessible. 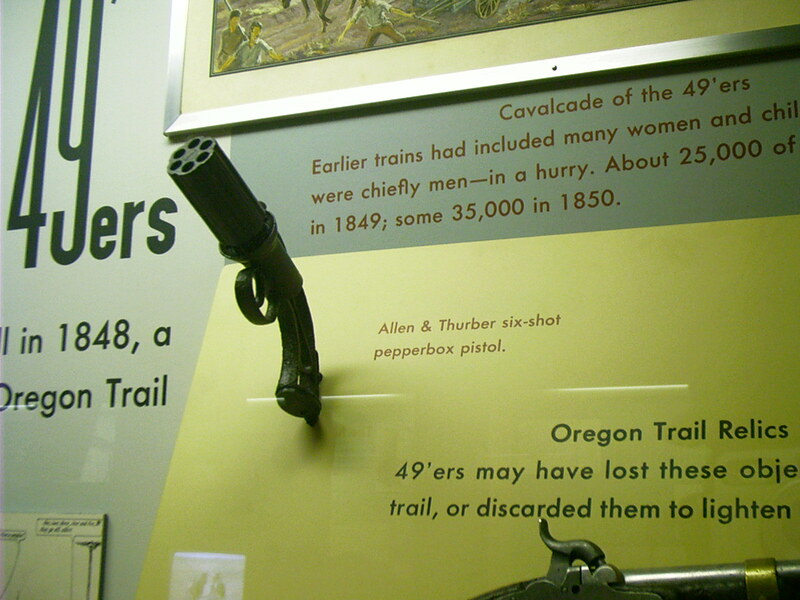 The transcontinental railroad opened in 1869 and put the quietus to overland traffic along the California Trail. I find it ironic that twenty years earlier all those forty-niners had trudged up the Continental Divide right past the spot where the gold they were after was waiting for them. 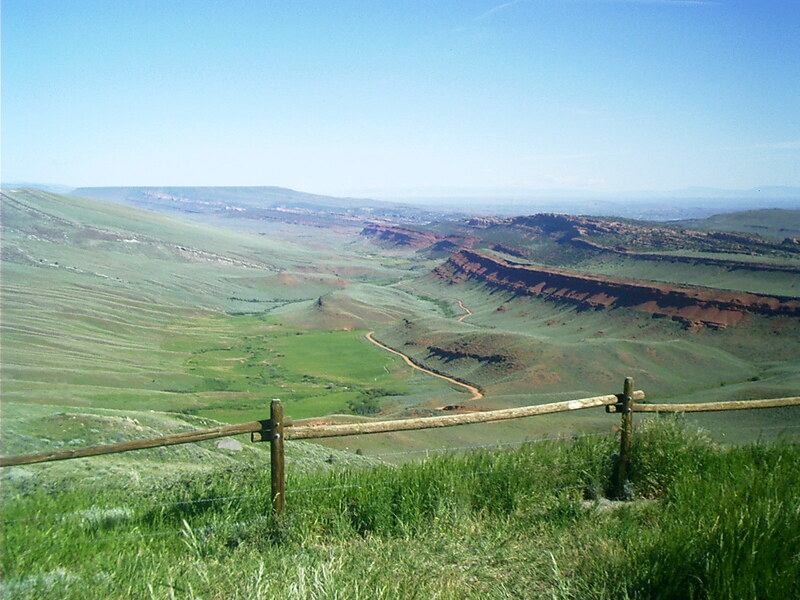 While South Pass City was expanding, residents found they could grow a little food in the valleys downslope toward Lander, WY, such as here on the floor of Red Canyon. "Proceeding down along the Popo Agie, Captain Bonneville came again in full view of the 'Bluffs,' as they are called, extending from the base of the Wind River Mountains far away to the east, and presenting to the eye a confusion of hills and cliffs of red sandstone, some peaked and angular, some round, some broken into crags and precipices, and piled up in fantastic masses; but all naked and sterile. There appeared to be no soil favorable to vegetation, nothing but coarse gravel; yet, over all this isolated, barren landscape, were diffused such atmospherical tints and hues, as to blend the whole into harmony and beauty. "In this neighborhood, the captain made search for 'the great Tar Spring,' one of the wonders of the mountains; the medicinal properties of which, he had heard extravagantly lauded by the trappers. After a toilsome search, he found it at the foot of a sand-bluff, a little east of the Wind River Mountains; where it exuded in a small stream of the color and consistency of tar. The men immediately hastened to collect a quantity of it, to use as an ointment for the galled backs of their horses, and as a balsam for their own pains and aches. From the description given of it, it is evidently the bituminous oil, called petrolium or naphtha, which forms a principal ingredient in the potent medicine called British Oil. It is found in various parts of Europe and Asia, in several of the West India islands, and in some places of the United States. In the state of New York, it is called Seneca Oil, from being found near the Seneca lake." • Irving, Washington. The Adventures of Captain Bonneville Digested from His Journal. 1837. 18 Feb. 2006. Project Gutenberg. 28 Aug. 2007 <http://www.gutenberg.org/files/1372/1372-h/1372-h.htm>. "Although you can't quite see the spot over the canyon rim, the site of Wyoming's first commercial oil well, drilled in 1884, is a few miles to the northeast in the Dallas Dome oil field. The field has produced over ten million barrels of oil since its beginning over 100 years ago." "The Nature Conservancy owns and operates the Red Canyon Ranch in the center of the canyon. The ranch produces native hay from the meadows on the canyon floor and grazes cattle on both the floor and surrounding slopes. The goal of The Nature Conservancy is to maintain the land in agricultural use and prevent fragmentation of wildlife habitat through subdivision development. Public lands managed by the Bureau of Land Management surround most of the Red Canyon Ranch's private land. The Wyoming Game and Fish Department also owns land in the canyon which it has designated the Red Canyon Big Game Winter Range. The State of Wyoming owns parcels of land in the lower part of the canyon near the Little Popo Agie (pronounced po-PO'-zha) River." • United States. Dept. of the Interior. Bureau of Land Management. "Red Canyon." 25 Aug. 2007 <http://www.blm.gov/wy/st/en/field_offices/Lander/rec/redcanyon.3.html>. Extraction has always been about getting the firmest possible handle on costs. Although the hard-rock mines are closed now, rest assured their owners know to the penny at present-day prices how much it costs to process a ton of ore from them and what the yield is. The price commanded by the refined metal is the real uncertainty. The possibility of falling into an abandoned mine shaft is a good reason not to go traipsing cross-country around here. The probability of encountering an irate proprietor is another. Panning the streams still goes on though. You can purchase the necessary equipment at the South Pass City Mercantile. You can even buy a little five-pound sack of dirt to sift through, which is guaranteed to have a 60% possibility of containing gold. Placer mining has been tried in these parts, and residents seriously consider how to circumvent current environmental barriers. A bigger impediment is lack of water. What I said isn't precisely true about extraction spelling the doom of a resource. An industrial scale operation leaves crumbs for gleaners, so there's more where that came from, and thus always more gold in them there hills. Rhode, Chuck. "Extraction." The Flat Route. 21 Jul. 2007. Lacus Veris. 24 Apr. 2019 <http://lacusveris.com/Moab/Snaps/Extraction.shtml>. Last modified 4 Oct. 2015. Served 6298 times between 16 May. 2010 and 24 Apr. 2019. Contact mailto:CRhode@LacusVeris.com?subject=The+Flat+Route.